Home » Books » 1 and 2 Thessalonians: How Can I Be Sure? 1 and 2 Thessalonians: How Can I Be Sure? When you suffer, do you wonder if God has forgotten you? Do you wonder whether you will be with Jesus after you die? Would you like to be sure that your life is pleasing to God? At times every Christian feels anxious or insecure about life--and about faith. The Thessalonians asked many of the questions you ask today, and Paul's letters helped them find assurance. 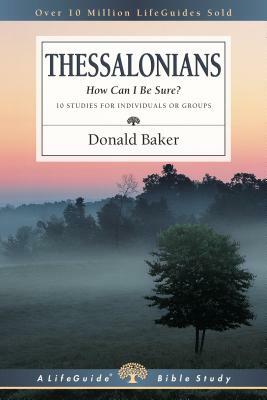 In these studies on 1 & 2 Thessalonians, Donald Baker shows how Paul's answers can help you to be certain too. This LifeGuide Bible Study in IVP's revised format features questions for starting group discussions and for meeting God in personal reflection, as well as a new "Now or Later" section following each session to help you act on what you learn.